The RMD features the 8.3-mile (13.4 km) Cactus Forest Loop Drive, which provides access to two picnic areas and the central trails. Hiking trails in the RMD are accessible to visitors not only from the Loop Drive but from trailheads near the east ends of two of Tucson's boulevards, Speedway and Broadway. About 7 miles (11 km) south of the RMD visitor center is a trailhead at the north end of Camino Loma Alta. It serves the Hope Camp and Ridge View trails, used by equestrians as well as hikers. It is possible to hike into the RMD from the east via two trailheads—Miller Creek and Turkey Creek—and from the north via the Italian Spring trailhead, all in the Coronado National Forest outside the RMD boundaries. The United States Forest Service manages these three trailheads and associated trails and the land around them. Angling across the RMD is the Arizona Trail, which enters the park east of Camino Loma Alta and exits near the RMD's northeast corner. From southwest to northeast, it overlaps the Hope Camp, Quilter, Manning Camp, Mica Mountain, and Italian Spring trails, passes by the Grass Shack and Manning Camp campgrounds and traverses Mica Mountain. The 800-mile (1,300 km) trail crosses Arizona from its border with Mexico on the south to its border with Utah on the north. Congress named it a National Scenic Trail in 2009. The national trail system is meant to preserve trails with maximum recreation potential and nationally significant scenery. No Saguaro National Park campgrounds are accessible by road, but the RMD is open to wilderness camping at designated sites along hiking trails. Douglas Spring, Grass Shack, Juniper Basin, Happy Valley Saddle and Spud Rock Spring campgrounds each have three campsites, and Manning Camp Campground has six. The site closest to a road is the Douglas Spring Campground, which requires a hike of about 6 miles (10 km) each way. A wilderness permit is required for overnight stays. Livestock such as horses are allowed on some trails but not others, and riding horses off-trail, near the visitor center, or in the picnic areas is prohibited. Horse trailers may be parked only in designated areas within the park or elsewhere outside the park. Livestock—defined by the NPS as horses, mules, or burros—must carry their own food and are not allowed to graze in the park. Manning Camp Campground is the main staging area for firefighters, trail-maintenance crews, and scientists working in the RMD. Their supplies are brought in by pack mules that are kept in corrals at the site. Since corral space and water are limited at Manning Camp, a maximum of 10 head of mules or other livestock at a time are allowed to stay overnight. Runoff from a nearby spring, the largest in Rincons, provides water for the livestock. Bicycling is allowed on the Cactus Forest Loop Drive and two park trails—the 2.5-mile (4.0 km) multi-use section of the Cactus Forest Trail inside the Loop Drive, and the 2.9-mile (4.7 km) Hope Camp Trail. The visitor center has bicycle racks and water fountains, but no drinking water is available along the biking trails. 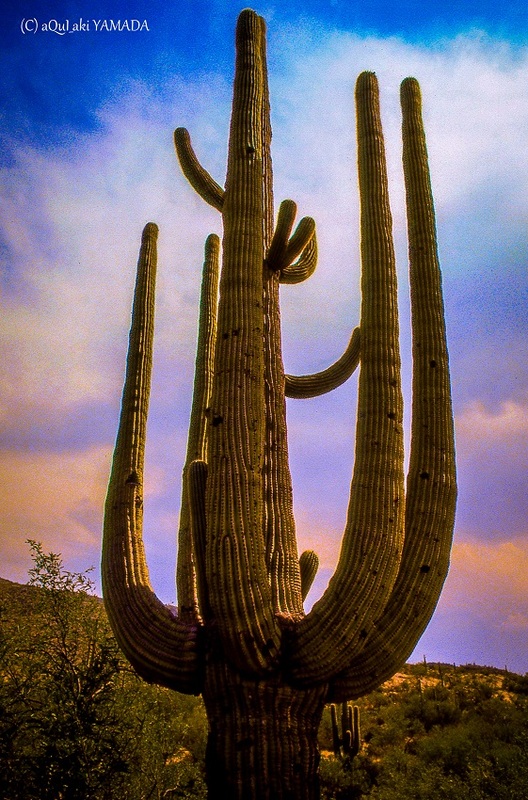 On a 40-acre (16 ha) plot adjacent to the RMD along Broadway, the Desert Research Leaning Center (DRLC) supports scientific and educational projects related to a network of Sonoran Desert parks, including Saguaro National Park. Between 9 a.m. and 4:30 p.m. on weekdays, the DRLC grounds, which include desert plants, an artificial tinaja, and a rainwater collection system, are open to the public. The Sonoran Desert Inventory and Monitoring Network of which the DRLC is part, covers 10 national monuments or parks in Arizona and 1 in New Mexico. Dee Dee Bridgewater - Little B's Poem "Afro Blue"